Last weekend, the U.S. Department of Commerce and the Small Business Administration (SBA) launched Business Sunday at Windsor Village United Methodist Church in Houston, TX. Business Sunday is an outreach and educational program that takes place in local communities around the country, connecting current and future business leaders with valuable resources to help them start or expand their businesses. On Sunday, Windsor Village’s Senior Pastor Kirbyjon Caldwell welcomed representatives from SBA, Commerce’s Center for Faith-based and Neighborhood Partnerships and Minority Business Development Agency (MBDA), along with representatives from the city of Houston and other local entities, for the first in a series of Business Sundays that will take place around the country. 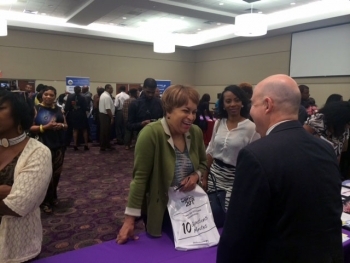 More than 500 people attended the event, showcasing the strong demand among business owners and entrepreneurs for information on the high-impact business development resources offered by the federal government. Originally piloted in Washington, DC, at the 19th Street Baptist Church in March 2014, the Business Sunday program consists of MBDA Business Centers partnering with SBA field offices and a local congregation to present information on federal business development resources from Commerce, MBDA, SBA, BusinessUSA and the Department of Health and Human Services (HHS). The event also provides attendees with an opportunity to connect one-on-one with the field staff. In the near future, additional Business Sunday events will be held in Philadelphia, PA; Mobile, AL; Washington, DC; Indianapolis, IN; El Paso, TX; Miami, FL; Denver, Co; Phoenix, AZ and Seattle, Washington. Details on upcoming events will be released once available. Find more information about upcoming events and webinars, as well as how to host your own Business Sunday event, at http://business.usa.gov/business-sunday.